Young adults in the UK are now driving less than young adults did in the early 1990s, according to a report commissioned by the Department for Transport. 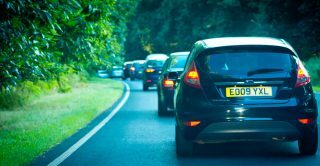 The Centre for Transport and Society, at the University of the West of England, and the Transport Studies Unit, at Oxford University, carried out a systematic review of evidence for transport use by young people and found that there was a sustained decline in the number of young adults driving. Driving licencing among young people peaked in 1992/4, with 48% of 17-20 year olds and 75% of 21-29 year olds holding a driving licence. By 2014 this had dropped to only 29% of 17-20 year olds and 63% of 21-29 year olds holding a driving licence. There seems to be a general trend for young people to make less use of cars for travelling. The researchers also found that the amount of travel young adults do in general has fallen, with the total number of journeys taken by young men falling by 28% and by young women 24%. During this period there has been a small increase in trips using public transport and cycling has remained fairly constant. What might have caused this change? The researchers found that changes in transport use were caused by changes in young adults socio-economic positions – increased participation in higher education, less secure jobs and a decline in disposable income. Young people have also been put off driving because of the high costs associated with owning a car. Those living in cities were particularly likely to reject driving in favour of using public transport. How was Understanding Society used? The research team used five Waves of Understanding Society from 2009/10 to 2013/14. They looked at employment trends and partnership formation over this time period and found a strong link between stable employment and car ownership. Partnership formation was also positively associated with owning a car.